Beautiful limited 4-owner classic beauty! A real gem! 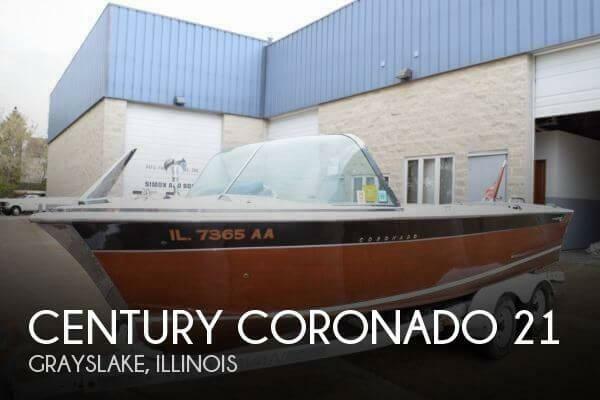 If you are in the market for an antique and classic boat, look no further than this 1963 Century Coronado 21, just reduced to $20,495 (offers encouraged). This boat is located in Grayslake, Illinois and is in decent condition. She is also equipped with a Chrysler engine. Overall very good condition. Has been in storage for several years. The planks were replaced by Don Morris from Blackhawk magazine, Lake Geneva Chapter, WI. . The Carburetor was Rebuilt in 2012 and it was last Tuned Up in 2007. Because it has been in storage, the engine will have to be at least cleaned. The trailer will need new tires prior to any long trip.